This pie could be accurately described as a little slice of heaven. Despite the leftover turkey and stuffing in my fridge, it is likely I will be eating this for dinner. Last night I threw a holiday dinner party - a chance to gather all of my favourite people in one place to talk over good food and good beer. It was a big success. I managed to cook a turkey all by myself (what a shock! despite the fact I wore rubber gloves at all times when handling it raw) and make a delicious dessert which paired beautifully with all of the other goodies that we ate. I've been eyeing this recipe and waiting for a reason to make it, so there really is no better than a holiday dinner party. Even if you're not very fond of eggnog (like myself, it's just too thick!) the flavour was gentle and so creamy. If I could marry a dessert, this would probably be it. AND thanks to this article I read on buzzfeed with 38 clever food hacks, I discovered that you can use a potato peeler to shave chocolate. Needless to say I had a hayday doing so. So not only does it look visually appealing (for once in my life - it's almost on par with last year's peppermint chocolate cake) like I have mentioned 10 times before, it was DELICIOUS. It's a shame most of my guest's were too full to enjoy it, but hey! More for me! If you're feeling ambitious (time was a constraint for me because I had to cook a turkey that took nine hours because our bottom element died midway through so we broiled it with tinfoil...we're all still alive) you could make a pie crust but I used a pre-made crust that just had to be baked for 8-10 minutes. In a mixer, whisk the whipping cream until stiff peaks start to form and then set aside. In a clean bowl, add eggnog, milk and vanilla pudding and mix until smooth. Let stand for 2-3 minutes until pudding mixture thickens. Once mixture is thickened, add half of the whipping cream and stir together. Set remaining whipping cream aside to pipe around edges before serving. Pour the pudding mixture into the pie shell and refrigerate until centre is firm. 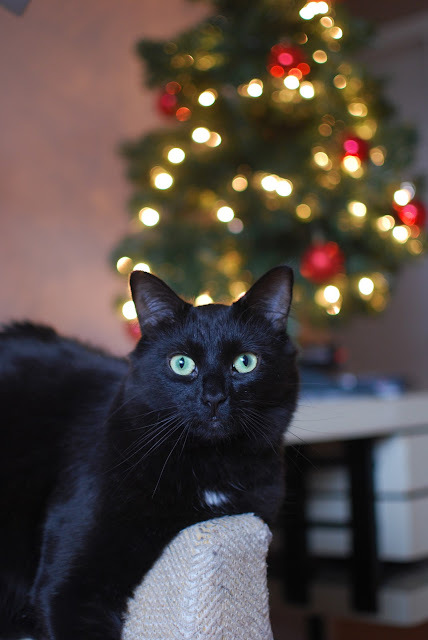 Here's Oliver looking festive for good measure. This is hopefully just the beginning of my holiday baking as I am now DONE my undergraduate degree at Carleton and passing time until I start a full-time job in the new year.